This weekend, for the first time in a long time, we had sunshine and temperatures above 20°F. This week we are going to get above freezing, well above freezing according to the local weather guy. I have now lived through the human equivalent of a diffusion experiment, and can report with some accuracy about the temperature dependence of activity and movement across phase boundaries. Temperature dependent diffusion is of course something I spend a lot of time thinking about, so here we go. At moderate temperatures, I diffuse easily into the outer world, going for walks, running errands, bopping around outside with my camera. As the temperature approaches 20°F, it becomes increasingly more difficult to get me to diffuse out of my house. Once we get below about 5°F, willing diffusion (as opposed to going for the mail or shovelling snow) is essentially done with. 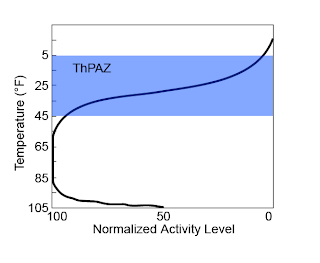 Once you are over about 40°F, my outdoor activity levels have reached their maximum; this lets me define the ThPAZ (Thermochronic Partial Activity Zone) as the range of temperatures from 5° to 40°F, of course analagous to the HePRZ (Helium Partial Retention Zone) and FTPAZ (Fission-Track Partial Annealing Zone), just at much lower temperatures. Of course the biggest difference between this diagram and similar ones you may be used to seeing for the HePRZ is the odd behavior at high temperatures, where activity again begins to decline. This high temperature inversion is highly dependant upon the partial pressure of water vapor in the system. At high humidities, the inflection point is at much lower temperatures, 80°F and I am done; at lower humidities the decrease does not begin until well over 100°F. ***I apologize for using Fahrenheit, but for discussing weather it is the only way my brain works. I have no feel for outside or room temperatures in Celsius. On the flipside, I can only think of science in metric terms. I have no idea what the range of granite melting temperatures in °F would be, or the average temperature at the base of the lithosphere. I'd have to do the conversions if I cared either way. We really need to standardize our units of measure.